Hey there Gunpla enthusiast, heard you thirsty for a new kit but you don't know where to go. Don't worry, your boy VGunpla has GOT you! In our pre-apocalyptic capitalist appropriative culture we worship the dollar for better or worse. But when you don't have a lot of disposable income every dollar counts and I want us to thrive as a Gunpla builder community. Part of that is getting your hands on Gunpla kits. If you're looking for Gunpla and you live near Dallas, you're in luck! We have some great stores that offer the latest kits and some that even host build gatherings and competitions on a regular basis. For this article I'll be focusing on 2 factors: selection and value. I went to 3 Hobbytown USAs, Madness Games & Comics and Animepop. I went to each store this past Tuesday, took a few pics and noted some Gunpla with prices. Price comparison across Dallas stores comes down to just a few dollars in most cases, with exceptions for larger kits. 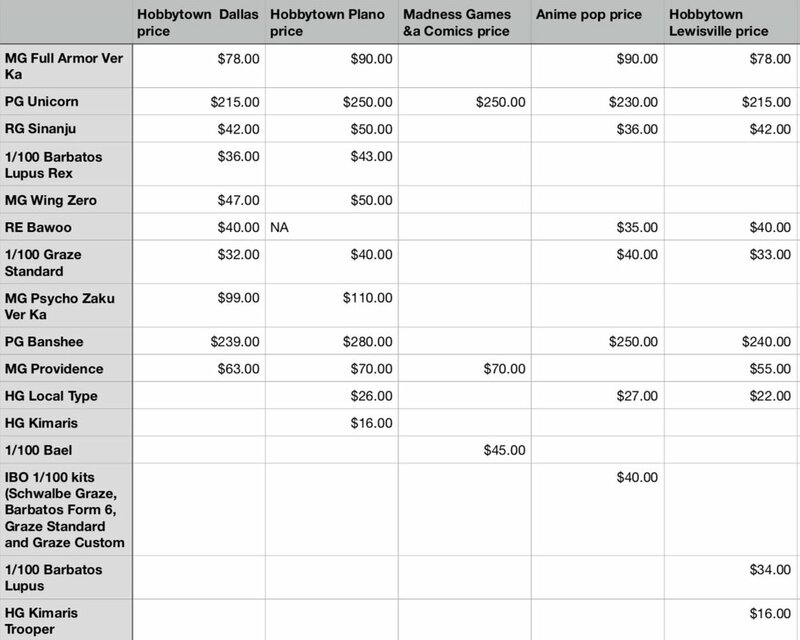 I wanted to do a price comparison with the same kits across all stores but the selections varied too much to make a real comparison, so I made a big list at the bottom of this post for reference. Ok, let's embark on our shopping trip! Hobbytown Dallas is located in East Dallas at 6060 Mockingbird Lane and are open 10-8 M-F, 10-6 Sat and 12-5 Sun. They have a small selection but seemed to have most of the current releases and offer a 10% discount for Texas Gundam Club Facebook members. Here's what I found: PG Zaku II $232, Full Armor Ver Ka $78, PG Unicorn $215, RG Sinanju $42, Lupus Rex 1/100 $36, Mg Wing Zero $47, RE Bawoo $40, 1/100 Graze Standard $32, Psycho Zaku Ver Ka $99, PG Banshee $239, MG Providence $63. For having a limited quantity there was a good variety, but unless they're hiding inventory in the back there is typically only 1 of each kit. Overall pretty good selection and fair pricing. Hobbytown Plano is located at 3303 N Central Expwy #220. Their hours are M-T 10-7, W-F 10-8, Sat 10-7, and Sun 12-5. The selection of kits is pretty good and they have a large quantity but their prices are on the higher side, especially the larger kits. They offer a 10% discount on kits if you are a member of the Facebook Texas Gundam Club, but cashiers usually don't offer up that information, so you have to ask for the discount. They also host regular build meetups, usually on a Saturday during the day. Here's what I found: Full Armor Ver Ka $90, PG Unicorn $250, RG Sinanju $50, Lupus Rex 1/100 $43, MG Wing Zero $50, 1/100 Graze Standard $40, MG Psycho Zaku Ver Ka $110, PG Banshee $280, MG Providence $70, HG Local Type $26, HG Kimaris $16. Our third destination is Madness Games and Comics. Let's go! There are Gundam figures mixed in with the kits, so if you're looking for a model and not a figure keep your peepers peeled! They have a section of SDs in another part of the store so be sure not to miss them! Heres what else I found: PG Unicorn $250, 1/100 Bael $45, MG Providence $70, 1/100 Mg hands $5, Converge SP08 $40. They had a holiday sale last November so keep an eye on heir Facebook page for sales, because their prices are pretty high except for their HG and SD kits. Our penultimate destination is the Anime jewel of Dallas, Animepop! Animepop is located at 4135 Beltline Rd #118. Their hours are M-Sat noon-8, and Sun 1-6. This place is like a bigger anime convention booth; they sell manga, videos, figures, Zoids kits and enough keychains and gachapon to sink the Space Battleship Yamato. They have a pretty good selection of Gunpla, rivaling Hobbytown Plano and Lewisville but unlike the local Hobbytowns they don't offer a discount. They have a reputation for high prices but after comparison, I think that's a bit undeserved. Here's what I found: Full Armor Ver Ka $90, PG Unicorn $230, RG Sinanju $36, IBO 1/100 kits $40 (Schwalbe Graze, Barbatos Form 6, Graze Standard & Graze Custom), RE Bawoo $35, PG Banshee $250, HG Local Type $27, and HG kits ranged from $13-17. Like Madness Games & Comics, larger kits are more expensive than other stores but HG and MG kits are pretty reasonable. Finally our trip ends with a real Gunpla treat, Hobbytown Lewisville! Hobbytown Lewisville is located at 500 E Round Grove Rd and their hours are M-F 10-8, Sat 10-6, and Sun noon-5. They offer a discount for Texas Gundam Club members and cashiers usually mention the discount if you buy a Gunpla kit. Some employees even extend the discount to supplies (paints, tools, etc.) if the supplies are for Gundam. Their variety is *top notch* especially since they also sell Mechatro Wego kits, and recently added Volks Five Star Stories and Maschinen Krieger (aka Mac K) kits. I've been shopping here for about a year and a half and while they do have an amazing assortment, they seem to take a little longer than other stores to get the newest kits in; they typically lag about 3-4 weeks behind other stores. This Hobbytown hosts regular build nights with giveaways, and competitions year round that culminate in the annual Grand Prix in August. Here's what I found for kits: Full Armor Ver Ka $78, PG Unicorn $215, RG Sinanju $42, 1/100 Barbatos Lupus $34, RE Bawoo $40, 1/100 Graze Standard $33, PH Banshee $240, MG Providence $55, HG Local Type $22, HG Kimaris Trooper $16. One more place worth mentioning is Barnes & Noble. I didn't visit any B&N stores on this trip because there are too many to hit in one day, and they don't usually carry many kits. They usually have a couple 1/100 IBO kits, a MG or two and a few HG kits. I've been Gunpla shopping at B&N for almost 2 years and usually I come away disappointed, but one time I caught a 75% off sale and came away with 4 HG and one MG kit for about $60, so you never know. That was a great deal, but that's one visit out of maybe 20 that I found something worth buying. On the whole I'd say it's not worth your time making a trip to B&N for Gunpla, but if you're already there, go take a look at what they have and be sure to look for a clearance section. There we have it! I'm lucky to live in a city that has good Gunpla shopping options, 2 regular build gatherings and competitions that draw talented modelers. If you live near Dallas go support our local stores and locally owned chain stores! I hope this was helpful and if you don't live in Dallas then keep this in mind if you ever visit us! Until next time, keep on building!